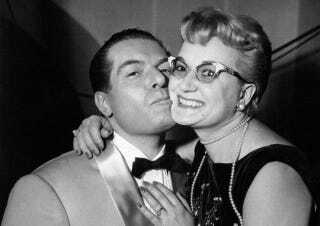 I don't really know much about Italian singer Flo Sandon's. And I especially don't know why her surname has an apostrophe like that. I couldn't even tell you what the lyrics to her song "Parole D'Amore Sulla Sabbia" mean. All I know is that I absolutely love it. I recall first hearing Flo Sandon's about a decade ago on the recommendation of eMusic, the paid DRM-free music subscription service. I used to adore eMusic back in the days when legally downloading music from iTunes came with some pretty nasty DRM. And whatever I downloaded to get eMusic to recommend Flo Sandon's, I'm sure glad I got it. Even without knowing a word of Italian, Sandon's "Parole D'Amore Sulla Sabbia" just echoes through as earnest, passionate, and... smokey? Is that a word I'm allowed to use here? Either way, there's really nothing more you could ask for in a midcentury singer. For best results, might I recommend popping open a bottle of your favorite red wine and rolling a few meatballs as big as your fist? It will only enrich the experience as you play this song on repeat, I assure you.